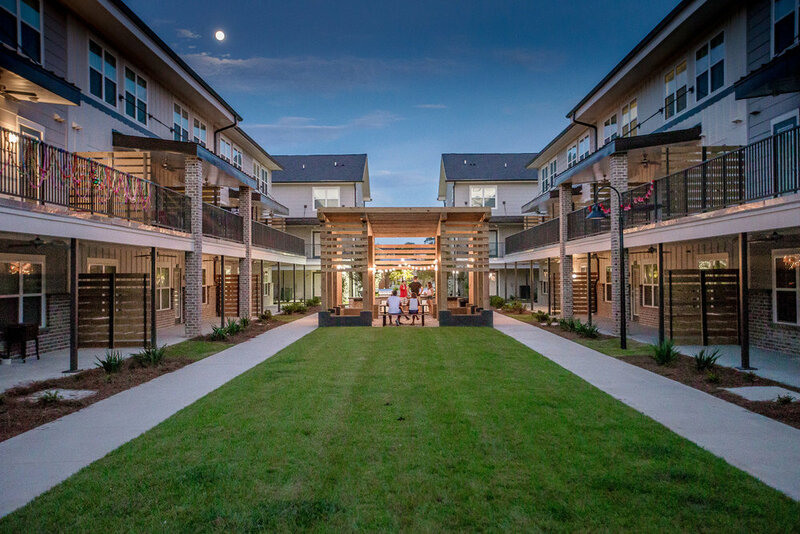 At Wildwood Baton Rouge, the clubhouse and leasing areas are treated more like a resort than typically expected in student housing. This spectacular property features referenced local materials mixed with unexpected elements such as a grand suspended ironwork lighting element created by a local artisan. Various amenities are not all contiguous, yet the design language breaks down similar geometry in different scales to accommodate multiple uses. An equal emphasis is applied to lounge/resort type amenities and multiple study areas each incorporating a multitude of seating types and access to charging stations. The clubroom and café areas, directly adjacent to the immense pool and spa, allow great indoor/outdoor connectivity with relaxation opportunities. Soft textiles applied in multiple hues of teal and blue, add acoustical absorption. Unexpected bright pops of orange are found in strategically located seating and artwork to inject a youthful energy to the property.